Welcome to Planet Earth Adventures blog! Our blog will give us a unique opportunity to share news, updates and Alaska content, while also offering a place for us to interact with our future guests. For thousands of years, sled dogs were an important method of transportation for the people of the north, hauling supplies in areas that were inaccessible by other methods. Until snowmachines became reliable, dog teams delivered mail and supplies to rural communities in Alaska. Sled dogs today are still being used by some rural communities in Alaska. The beginnings of sled dog racing began in Alaska in 1908 with the All-Alaska Sweepstakes. In 1925, there was a diphtheria outbreak in Nome Alaska. There was not enough serum in Nome to treat the people infected by this disease. There was serum in Nenana but the town was over 700 miles away, and it was inaccessible except by dog sled. A dog sled relay was set up by the villages between Nenana and Nome, and dog teams worked together to relay the serum to Nome. It took six days for the serum to reach Nome. In 1973, the Iditarod Trail Sled Dog Race got started, and its popularity grew over the years. Today, the race is the most popular sporting event in Alaska, where the top mushers and their teams of dogs are local celebrities. This popularity is credited with the resurgence of recreational mushing in the state since the 1970s. The Iditarod Trail Sled Dog Race is an annual long distance sled dog race that starts on the first Saturday in March on Fourth Avenue in downtown Anchorage. The Iditarod trail goes from Anchorage to Nome (1,049 miles) and it takes about 8 - 10 days to complete. There is a northern route and a southern route and these are used on alternate years (north in even numbered years). The winning musher takes home a large cash prize and the last musher to finish the race extinguishes and wins a red lantern at the finish line. No one who races sled dogs is going to get filthy rich any time soon, even if they win Alaska's Iditarod Race. The prize for winning the Iditarod race is roughly about $50,000 and a brand new Dodge Ram truck. That money doesn't even pay for the annual dog food bill for many competitive mushers, who keep dozens of dogs in kennels geared to breed the sturdiest, fastest runners. Some mushers spend upwards of $70,000 per year to feed and care for their dogs. For many mushers, they solely rely on sponsors, part-time work and prizes from other smaller races. Now I bring out the controversy over dog sledding and I know that this may upset some folks out there. There is a lot of people and groups like PETA portraying that the Iditarod is an inhumane race that kills dogs. Some people feel it is cruel to make a dog run or pull people for our pleasure, similar to saying it is cruel to make a horse carry a person. Those who want the race to end are disseminating information that can be misleading at best and inaccurate at worst. What many people who are against the Iditarod don’t realize is that the people who work with sled dogs love for and care for their dogs. Only the people who abuse their dogs end up in the news because our society is far more interested in all the negative stories than in positive ones. The Iditarod is a race, which when run responsibly, is a way for these animals to fulfill their athletic abilities and for mushers to bond with their dogs in a way most pet owners can’t even comprehend. Mushers have a very close relationship with their dogs and consider them as family. These dogs are work dogs, meaning they need to have a job to do or they can become restless and self-destructive. These dogs actually like doing their job unlike many humans. These dogs need to run long distances, which is why huskies have a reputation for running away. Most home owners think that a 30 minute walk twice a day is sufficient exercise for their dogs. Sled dogs need several hours of exercise every day. They are pack animals and need the company of other dogs. I am a dog/animal lover and the last thing in this world I would want to see are animals being treated badly or made to do something un-natural. Over the last 20 years in Alaska, I’ve seen all of it, with my own eyes, experienced it, visited many dog kennels and talked to a lot of mushers and I am here to tell you that I completely disagree with that point of view. You cannot force a dog to run. If a dog doesn’t want to run they will likely lie down or back out of its harness and there is nothing you can do to get the dog back up. Anyone who has ever had the opportunity to see a team get hooked up knows that the problem is not getting the dogs to run, the problem is getting them to stop. When you put harnesses on the dogs, they pull forward in harness. They have not been taught or trained to do this and this is natural for them. These animals love what they do. Their excitement when they see the harnesses and sleds come out is beyond words. I challenge you to witness this first hand before you make any judgement or make up your mind that making these dogs run is the wrong thing to do. The wrong thing to do would be to not let these dogs do this! We offer tours to see this Last Great Race. Come and see for yourself what this event is all about and watch as thousands of excited dogs pack downtown Anchorage on their personal quest to Nome. 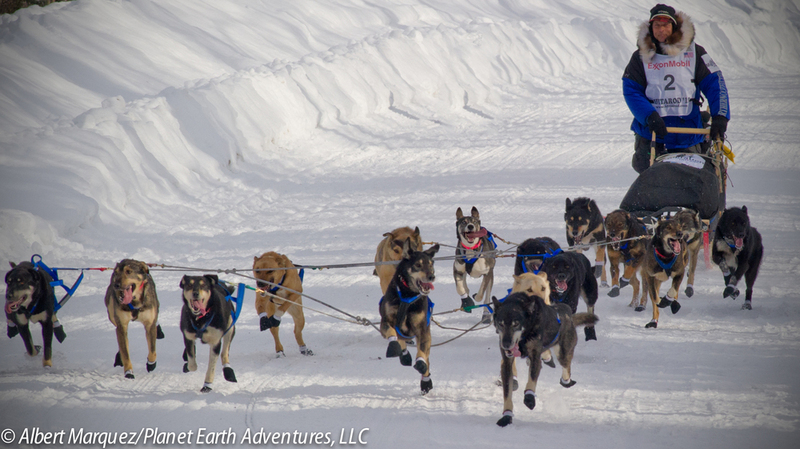 Check out our up-coming Iditarod & Northern Lights Tour.